We are living in a world where people hardly tolerate everything that is far from their own culture. “Parler en paix” provides a place, in Paris, where Arabic and Jewish cultures can find a common ground. The association has been founded in 2004 in Paris. It provides lessons in both Arabic and Hebrew in order to underline the similarities between them, and consequently, in order to help people starting to perceive the “other” as an opportunity to enrich themselves. The association Parler en paix has been awarded in 2016 by the “Vivre ensemble” (living together) trophy – a recognition gave to associations that are engaged, within the french society, to promote policies that carry out a social cohesion. The organization has the peculiarity to be laic and apolitical. But let’s give the floor to Véronique Teyssandier, President of the association. When was the association born? In 2004 there has been at la Villette the first “Salon des initiatives pour la paix”. It has been a harsh period of political and communitarian tensions concerning what was going on in Israel and Palestine, and usually what happens there has an influence also here (in the western world). So an Arabic professor and a Hebrew one met and decided to create a place where people could learn those two languages and the two cultures at the same time. What is your story? How did you become the President of the association? Six years ago I have joined the association and since four years I am the President. I was interested in learning Arabic, so when I read an article about this association I appreciated the intention of spreading the ideas of peace and living together through the languages and culture. I’m a French language teacher and I have many students that come from South Korea and Japan and from their respective native countries they criticize everything about the other nation, however when they are together in class trying to learn French, they started getting along with each other, finding out that they have many things in common, and this is only because of French. Sharing the burden of learning a new language helps them to concentrate on what makes them alike instead of what differentiates them. Why does the association have no political implications? Because the founders wanted to focus only on languages and cultures to “découvrir l’autre” (discover the other). The subscribers do not talk about politics or religion. In this way people that would have never had the chance to meet each other – because of their belonging to different social circles – can now start talking and can find out that they share more than they thought. They learn to perceive the other and they understand that the other may share the same interests. And why does it also have no religious implications? I get to know that people perceive those two languages mainly through their respective religions. On the other hand, when it comes to talk about other languages, they aren’t related to any belief. Furthermore, when it comes to talk about religions, people become very sensitive. So, since we wanted to preserve a peaceful environment, the founders decided to approach the religions only from a cultural point of view (pas cultuel, mais culturel). The point is that subscribers have to learn Arabic and Hebrew at the same time. So classes are once a week, one week they study for 1 hour and 15 minutes a language, then they make a break of half an hour and for the rest of the time they study the other language, the week after it is the other way around. 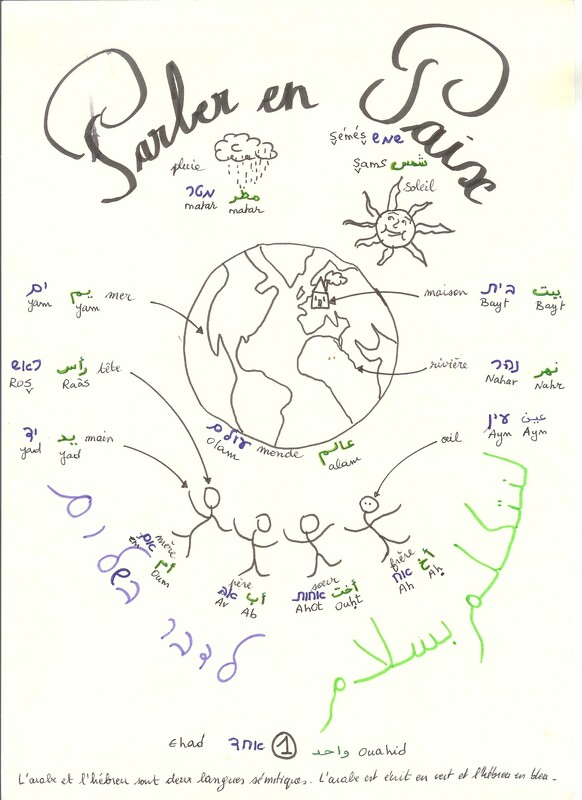 Since last year, twice a year the Arabic and the Hebrew teachers do class at the same time, to show the common features of these two languages. Do you also organize many cultural events? We publish a monthly and weekly cultural newsletter and we organize regular cultural events. For example, we went to this dancing show called “Au temps où les arabes dansaient”, it was a show of contemporary dance inspired by the dance of the 50’s Arab filmmaking. At the end of January, we went to the theatre Manufacture des Abbesses to watch a play inspired by the book “Le nazi et le barbier” written by Edgar Hilsenrath (ed. a German-Jewish writer born in 1926 currently living in Berlin) and we had the chance to have a debate with the performer. Moreover, every year we try to organize a trip during the Easter holidays, so this year we will go to Bosnia, Sarajevo and Mostar, to discover the Jewish and Arabic heritage in that nation. Have you faced episode of racism? Especially after the terrorist attacks in Paris of 2015? Not at all! On the contrary, we got more subscriptions, because people felt that something has to be done, something to bring people closer. As a matter of fact many thanked us for the service we provided, because we are the only association in Paris that are committing to create a common place for these two communities. Parler en paix it’s the only association in Paris that has engaged to create a bridge between Arabic and Jewish world, without any political and religious involvements. The peculiarity of this association lies in the fact that it has find a way to bring closer these two people through what they both share. Surely their main field of action is within France, consequently they do not claim to accomplish any result outside their borders; on the other hand we are living in a transnational world, meaning that relations between people are affected across nation’s borders. In other words, although the main goal of Parler en paix is to promote the two cultures within their plurality in Paris, their activity might be perceived as a starting point to overcome the tormenting conflict that has been burdening Arab and Jewish people for more than 60 years. In any case the idea of excluding both the politics and the religions is the reason why it has been so successful. As a matter of fact to promote peace between people there is the need to focus on what unify us and not on what makes us different. The peace process commences from the action of civil society and the reconciliation can start only through the recognition of the other, first of all as a human being.